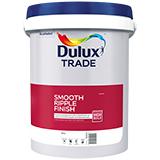 Dulux Trade Smooth Ripple is a smooth, washable paint with a rippled finish for interior and exterior plaster and concrete walls.Useful for converting uneven concrete surfaces to an even, grit-free, smooth textured finish. Particularly suitable for wall areas where there is heavy traffic, e.g. corridors, alleys etc.